Patsy Andersen-Presley's story has been much a part of this website from the beginning. She was introduced on the "Coming Soon!" page and followed on this page following a massive heart attack earlier this year (click through "Older" at the bottom right of this sub-page to see her progress. Evidence points to "legal" theft (Or is it illegal???) against her. She is a law-abiding citizen having become victim to some rare twists. 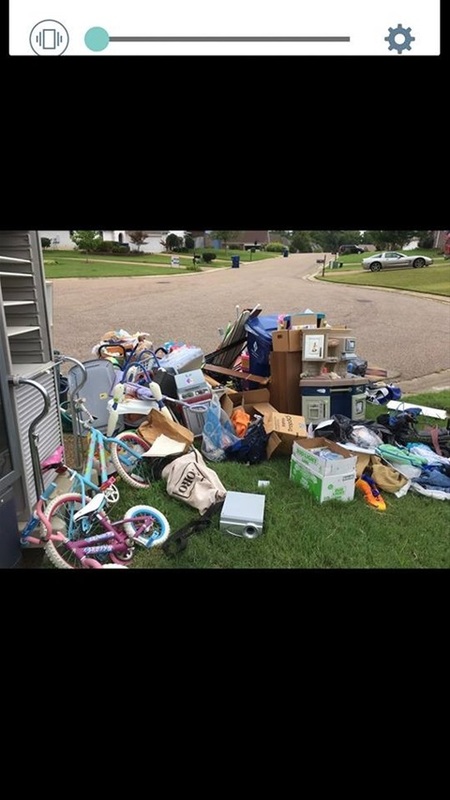 The accompanying picture was on her Facebook post last night of her grandchildrens' toys as result of eviction from her home near Memphis, TN. Knowing her as I do there is no question that she is being grossly abused in a corrupt and unjustified series of events. Please, join the efforts of her fans to find the right person, persons or entities that has the means of making a positive difference in her plight. You would have a difficult time believing how she has become such a victim as to break under the weight of tremendous pressure to initiate "heart failure". Please join me in continuing to call for God's intervention. As you may know, Job of the Old Covenant Scriptures was not spared even of heart-rending weight placed on him by God's opponent. It was only after the grueling test seldom if ever faced by a mortal that God stepped in and put an end to his misery with more blessing than ever imagined. In Patsy's case the question is, "Can she even survive the ordeal long enough to see a resolution?". Wink Martindale of the "Tick Tack Dough" (1978-85) TV show once indicated that Patsy was the best organizer he had ever seen. Such compliment along with her being the sole caregiver to her late father and mother says so much of her character. I've watched her numerous times while shopping engage with her's and Elvis' fans who were poorly dressed engage with them for long periods of time as if their poverty had no ill effect on her vast ability to relate to the "least to the greatest". I doubt that the celebrities who know her are aware of her plight. Can you imagine the embarrassment she is facing? She's a giver, not a beggar! I envision only a massive viral campaign on Social Media will reach out to the right sources to turn her fate. This story ought to hit the national news! What a story that would make. I'm sure someone would be informed and so touched that her life would be a complete turn-around even worthy of a heart-touching movie subject based on a true story. The legal system has failed her. God, please help us through your loving kindness to bless Patsy beyond our wildest dreams. We thank You through Your Son and Mediator, Jesus. Amen!